MINNEAPOLIS--(BUSINESS WIRE)--Jan. 25, 2017-- Arctic Cat Inc. (NASDAQ: ACAT) today announced that it has signed a definitive merger agreement under which Textron Inc. (NYSE: TXT) will acquire Arctic Cat in a cash transaction valued at approximately $247 million, plus the assumption of existing debt. Under the terms of the agreement, which was unanimously approved by the Arctic Cat board of directors, Textron, through a wholly owned subsidiary, will commence a tender offer to purchase all outstanding shares of Arctic Cat at $18.50 per share in cash, representing a 40.7 percent premium to the closing price of Arctic Cat's common stock on January 20, 2017. Arctic Cat anticipates that tender offer materials will be provided to shareholders no later than February 7, 2017. The completion of the acquisition is subject to customary conditions and regulatory approvals. Baird is serving as financial advisor and Fredrikson & Byron is serving as legal counsel to Arctic Cat. Shearman & Sterling LLP is serving as legal counsel to Textron. Textron Specialized Vehicles Inc. is a leading global manufacturer of golf cars, utility and personal transportation vehicles, professional turf-care equipment, and ground support equipment. Textron Specialized Vehicles markets products under the E-Z-GO®, Cushman®, Textron Off Road™, Jacobsen®, Dixie Chopper®, Ransomes®, TUG™, Douglas™, Premier™ and Safeaero™ brands. Its vehicles are found in environments ranging from golf courses to factories, airports to planned communities, and theme parks to hunting preserves. Textron Inc. is a multi-industry company that leverages its global network of aircraft, defense, industrial and finance businesses to provide customers with innovative solutions and services. Textron is known around the world for its powerful brands such as Bell Helicopter, Cessna, Beechcraft, Hawker, Jacobsen, Kautex, Lycoming, E-Z-GO, Greenlee, Textron Off Road, Textron Systems, and TRU Simulation + Training. For more information visit: www.textron.com. The tender offer described in this communication has not yet commenced. Neither this communication nor any information incorporated herein by reference is an offer to purchase or a solicitation of an offer to sell any shares or any other securities of Arctic Cat Inc. (“Arctic Cat”). On the commencement date of the tender offer, Aces Acquisition Corp. and Textron Inc. will file a Tender Offer Statement on Schedule TO (“Schedule TO”), including an offer to purchase, a letter of transmittal and related documents, with the United States Securities and Exchange Commission (the “SEC”). Thereafter, Arctic Cat will file a Solicitation/Recommendation Statement on Schedule 14D-9 (“Schedule 14D-9”) with the SEC. Security holders are urged to read, carefully and in their entirety, both the Schedule TO and the Schedule 14D-9 regarding the tender offer, each as may be amended from time to time, and any other documents relating to the tender offer that are filed with the SEC, when they become available because they will contain important information relevant to making any decision regarding tendering shares. These materials will be made available free of charge on the “Investor Relations” section of Arctic Cat’s website at www.arcticcat.com when available. In addition, all of these materials (and all other materials filed by Arctic Cat with the SEC) will be available at no charge from the SEC through its website at www.sec.gov. 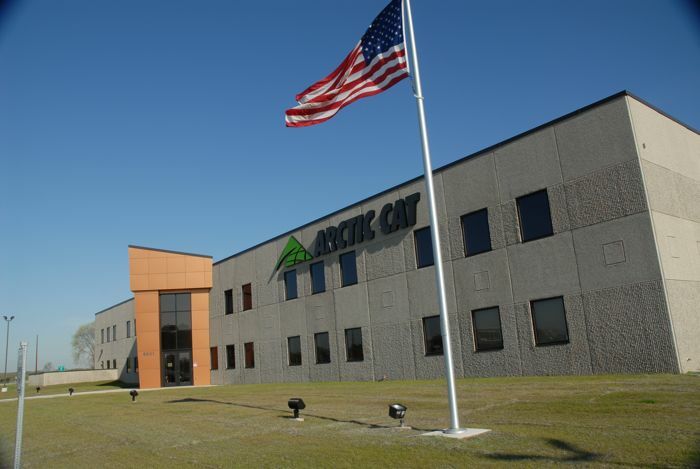 Security holders may also obtain free copies of the documents filed by Arctic Cat with the SEC by contacting Investor Relations/CFO at Arctic Cat Inc., 500 North 3rd Street, Minneapolis, MN 55401; telephone number (612) 350-1791. Statements in this press release regarding the proposed transaction between Arctic Cat and Textron, the expected timetable for completing the transaction, future financial and operating results, benefits of the transaction, future opportunities for Arctic Cat’s business and any other statements by management of Arctic Cat concerning future expectations, beliefs, goals, plans or prospects constitute forward-looking statements. Generally, forward-looking statements include expressed expectations, estimates and projections of future events and financial performance and the assumptions on which these expressed expectations, estimates and projections are based. Statements that are not historical facts, including statements about the beliefs and expectations of the parties and their management are forward-looking statements. All forward-looking statements are inherently uncertain as they are based on various expectations and assumptions about future events, and they are subject to known and unknown risks and uncertainties and other factors that can cause actual events and results to differ materially from historical results and those projected. Risks and uncertainties include the satisfaction of closing conditions for the acquisition, including the tender of a number of shares that, when added to the shares owned by Textron and its affiliates, constitutes a majority of Arctic Cat’s outstanding shares on a fully-diluted basis; the possibility that the transaction will not be completed, or if completed, not completed on a timely basis. Arctic Cat cannot give any assurance that any of the transactions contemplated by the agreement will be completed or that the conditions to the tender offer will be satisfied. A further list and description of additional business risks, uncertainties and other factors can be found in Arctic Cat’s Annual Report on Form 10-K for the fiscal year ended March 31, 2016, as well as other Arctic Cat SEC filings. Copies of these filings, as well as subsequent filings, are available online at www.sec.gov and www.arcticcat.com. Many of the factors that will determine the outcome of the subject matter of this communication are beyond Arctic Cat’s ability to control or predict. Arctic Cat does not undertake any obligation to publicly update or revise any forward-looking statement, whether as a result of new information, future events or otherwise. Right on the heels of the Ctech 2 800,they owned Polaris for a while,lets see what happens! 4 aircraft companies plus Lycoming to get technology from. Welcome to the mad house. Don't mind the rubber walls. Drugs are served an hour before breakfast and and hour after dinner. Don't drool on the furniture , keep your feet off the table, and don't make the guys in white coats mad. We really shouldn't be surprise although I am. AC is a small company trying to compete with much larger companies. It makes sense from a business perspective. Weber made lots of engines for Polaris and others in the past. It will be 2-3 years before we see any changes or new things in the products but it should help arctic cat stay competitive especially in the engine area. Sled: 2015 XF8000 LXR 137"
Well, Cat's share values have been dropping due to poor snowmobile sales and a crap load of incentive costing leftover sleds dating back to 2013 at some dealerships. The crappy winters have reeked havoc on their sales. Money having to be spent on leftover incentives takes money directly away from R&D. Plus it costs a TON of money to develop technology and a lot less to acquire shared technology. Look at Ford and GM; they have started developing their transmissions together (no use two companies spending the same money to end up in the same place; just share the expense and the end result). As long as Cat stays profitable long term, this is nothing but good for Cat. There will be an immediate influx of cash for R&D plus a HUGE range of various companies to draw technology from including aerospace, defence, and electronic/GPS technologies. I doubt this will affect the YamiCat relationship for a while as I don't think Textron has a 4 stroke they can just drop into a Cat chassis. And now when Doo wants to sue Cat for anything, there's a lot deeper pockets to fight lol. It's not about how fast you get there; it's about the fun you have along the way! Textron owns Lycoming aircraft engines although they seem to be all pushrod. This isn't a merge, they got bought. For only $247million too. I know that may seem like a lot of money. But Polaris is a 5.6B yes billion dollar company. To buy them today like AC was just bought would cost you 7-10 BILLION. Yamaha is a 6+ billion dollar company. Reason: It looks like Textron wants to expand into the powersports business. They bought Weber engines and Bad boy buggies in just the last 3 years. I guess I'll have to wait and see (I feel like I'm saying that a lot these days). It could be good cash flow but it also a little disappointing that AC isn't independent. AC has such a cool history, I guess this is just another chapter but the fact that it was brought back to life by enthusiasts. Last edited by kopeck; 01-25-2017 at 09:36 AM. The powersports motors will likely be weber sourced or based. They have a 850 4stroke that makes 80HP, a turbo verison that is 120hp. In a UTV mag article they mention a under 1000cc class engine that makes 120ish hp too. I speculate that the next generation of 4s engines in the sleds, utv's will not be from Kymco or Yamaha. But it will take 2-3 years. AC has such a cool history.